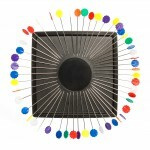 This little pin cushion (sans the cushion) is the hot notion on the market right now. Toss you pins in the vicinity of the Zirkel and like magic they place themselves in the handy position shown here. Works with all sizes of pins. Pick one up between now and this coming Saturday (9/26) and take 15% off. No coupon needed . . . just mention that you saw the offer in the Quiltzette. Getting your UFOs organized for the fall/winter sewing season? 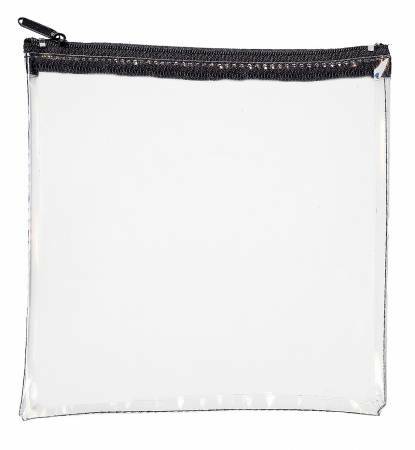 Put them in these wonderful clear project bags and you'll be able to quickly and easily see what you want to work on next. Available in two sizes. 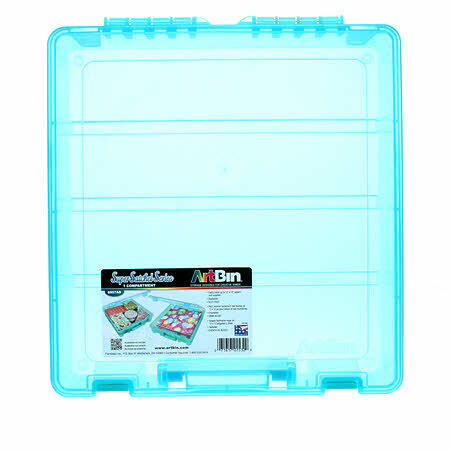 For larger projects consider one of these great plastic storage bins. They're 15" x 14" x 3-1/2" deep. Okay, white-on-white and cream-on-cream might not seem too exciting . 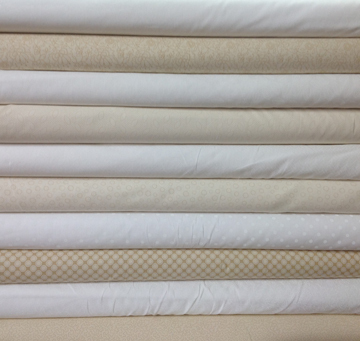 . . until you NEED one of these fabrics for a project. Then finding the perfect bolt becomes really exciting. We received this nice collection last week. 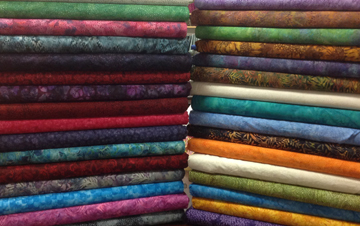 And if you need some new color in your life this pretty stack of batiks also arrived last week. Peggie’s back! She’ll be teaching one of her favorite classes on September 25 . . . Classmates. 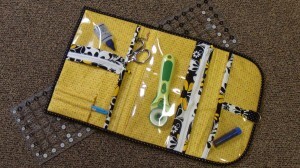 This little tote is so handy for sewing notions. If you’ve taken classes here you’ve no doubt seen students using their Classmate bag. Vinyl pockets make it easy to find what you need and zippers keep everything where you left it. Sign up today to join Peggie for this fun class. Homework: do your cutting ahead of time so that you leave class with a finished project (not another UFO!). Sine Skaggs loves making small wool projects and has agreed to teach a class and share the techniques she’s acquired over many years of doing this relaxing hand work. We have a nice variety of kits from which to choose available for the class. Shown here is one of them. These small projects are perfect to take along for your holiday travels and they also make wonderful gifts. We will be taking up to ten students in this class since sewing machines are not required and we’ll have more space in the classroom as a result. Sign up today. This month our BERNINA club will feature a “make and take” project. We will be making a small (7” x 27”) reversible holiday table runner. 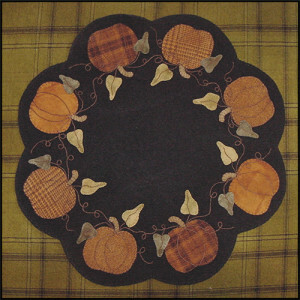 One side will feature Christmas fabrics and the other will feature fall fabric. Techniques will include decorative stitches, using a double needle, specialty threads, and a variety of feet. Bring your own sewing machine or use one of ours. The kit will include all fabric and batting for the project. Please call 970-565-7541 or e-mail Cindy no later than Tuesday, September 22 at 12 noon to reserve your space so that we’ll have enough kits made for everyone. You do NOT need to own a BERNINA to attend this event. We recently purchased this wonderful, bright, large Light Pad for the shop. It's a real time-saver when tracing onto fusible web for an applique project. The lighted space accommodates an 11" x 17" pattern. When you purchase a pattern and fabric for an applique project at Cortez Quilt Company you can reserve the Light Pad to use free of charge (at the shop only . . . it can't be "checked out"). If you'd like to use for a project you purchased elsewhere there will be a $10/hour fee. 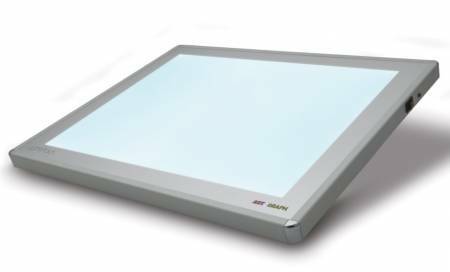 If you'd like to purchase a Light Pad for home use this one retails for $269. 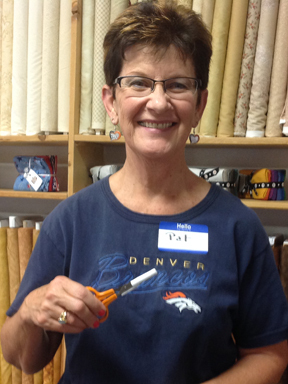 Our tip this week is courtesy of Pat Atkinson who was in class at Cortez Quilt Company this past Saturday. Pat discovered an elegant solution for scissor storage whether you're traveling to class or simply keen on sewing room safety. You probably have a BIC "Stick Pen" somewhere around your house. Check the bottom of your purse of the junk drawer in the kitchen. 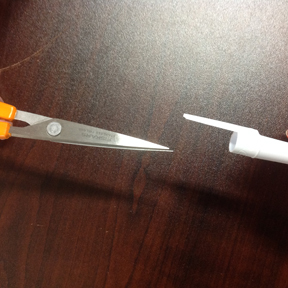 Turns out the cap fits perfectly over the point of small scissors. 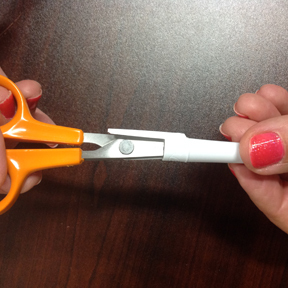 Now you can protect your scissors (and yourself) using this easy tip. Thanks, Pat!